Do you have an abundance of fresh rhubarb, or maybe some leftover rhubarb in the freezer? Here's a quick and easy way to use up extra rhubarb and get in some of those rhubarb health benefits. Rhubarbade and strawberry rhubarbade are two versions of “rhubarb lemonade” style rhubarb drink recipes. 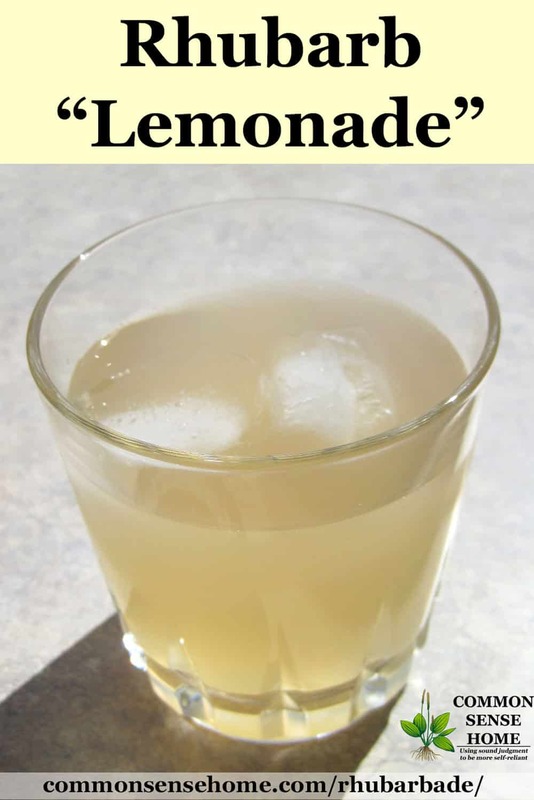 They're easy to make, and work fairly well as sugar free drinks when you sweeten with liquid stevia. This recipe is adapted from the book From Asparagus to Zucchini: A Guide to Cooking Farm-Fresh Seasonal Produce. It's one of my “go to” recipe books when fresh produce is in abundance, along with The Garden Fresh Vegetable Cookbook and Too Many Tomatoes. From Asparagus to Zucchini also gives storage and cooking tips, as well as background information on the produce. It was created by the Madison Area Community Supported Agriculture Coalition. Puree rhubarb in food processor, blender or electric juicer. (I used my Vitamix.) Strain through cheesecloth-lined strainer or fine mesh strainer, pressing solids. I used my nylon kefir grain strainer. A jelly bag would work well, too. Let stand several minutes, then skim froth from surface, if desired. Note: When I used frozen rhubarb, I didn't get any froth. It's up to you how much you strain. This year we used our juicer and fresh rhubarb, and it was frothy, but we don't really care, so no skimming here. For every two cups rhubarb liquid add 3/4-1 cup sugar or 3/4 to 1 teaspoon liquid stevia extract and 6 cups water. You may also use lemon flavored stevia extract. Serve chilled. For every two cups rhubarb liquid, yield is 2 quarts. If you prefer to use honey, dissolve it in warm water before mixing with the juice. 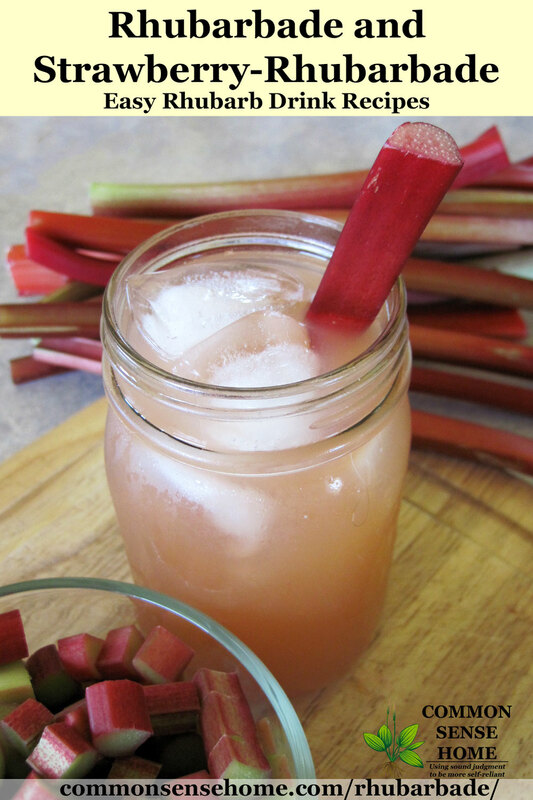 I’d recommend 2/3 – 3/4 cup per two cups rhubarb juice. The boys said they would drink it, even though they don't normally like rhubarb. Husband said he thought it was good and tasted like apples. I think it's pretty tasty, and it's a great way to use up freezer rhubarb, which tends to be a little stringy in recipes. Plain rhubarb lemonade tends to be a little pale (like lemonade), I thought I'd add a little color with some strawberries we had in the freezer. Yummy! We juiced around a cup of thawed strawberries and then continued with rhubarb to get two cups of juice total, and it was delicious! We've also used tart cherries and are planning to try raspberries. The little punch of extra color and flavor really takes this drink to the next level. Somehow the strawberry-rhubarb combo tastes more like fresh strawberries than the strawberries do on their own. It's great! Rhubarbade and strawberry rhubarbade are two versions of “rhubarb lemonade” style rhubarb drink recipes. They're easy to make, and work fairly well as sugar free drinks when you sweeten with liquid stevia. Puree rhubarb in food processor, blender or electric juicer. Strain through cheesecloth-lined strainer or fine mesh strainer, pressing solids. I used my nylon kefir grain strainer. A jelly bag would work well, too. Let stand several minutes, then skim froth from surface, if desired. It’s up to you how much you strain. For every two cups rhubarb liquid add 3/4-1 cup sugar or 3/4 to 1 teaspoon liquid stevia extract and 6 cups water. You may also use lemon flavored stevia extract. Serve chilled. For every two cups rhubarb liquid, yield is 2 quarts. If you prefer to use honey, dissolve it in warm water before mixing with the juice. 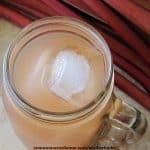 I’d recommend 2/3 – 3/4 cup per two cups rhubarb juice. 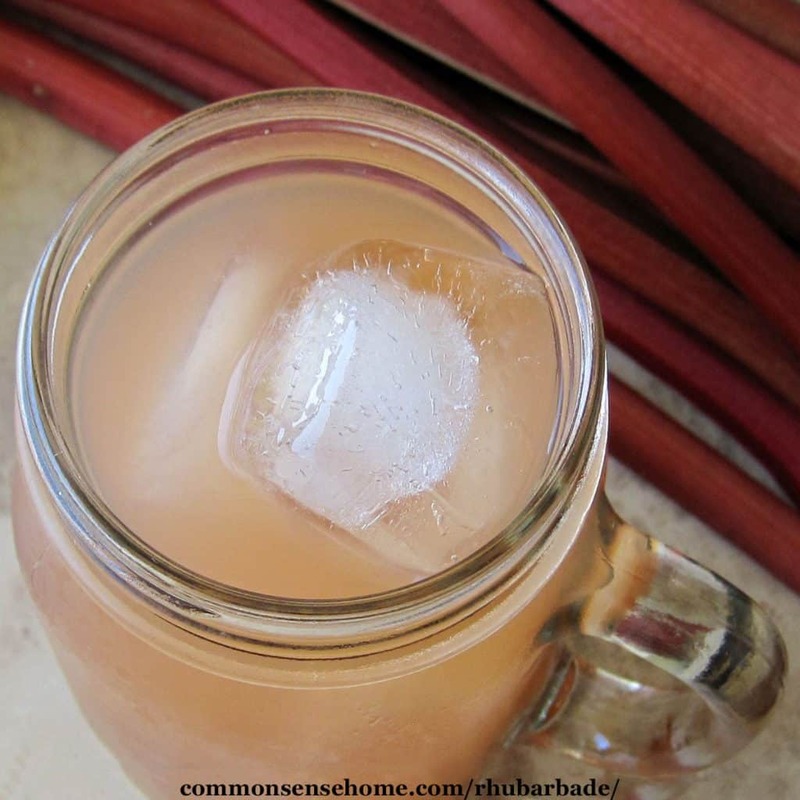 If you're looking for a rhubarb drink recipe with a little more kick, try rhubarb cherry wine. Thanks so much for sharing a rhubarb recipe. I have 4 patches of rhubarb and have never thought of making a drink with it. Do you cook it before you puree it? I wonder how it would taste with honey as the sweetener? I’m going to try getting juice by putting it through a masticating juicer, a Twin Star. This sounds delicious! Thanks for the inspiration, and congrats on being featured on Gnowfglins! when is rhubarb planted, in what conditions when does it come up, I have a shed near the garden I could put some in there , where do I get plants or seeds? I’d probably either put in a ground cover crop (like oats or buckwheat) or apply a mulch (like straw) to protect the soil until spring. You can buy rhubarb plants from online nurseries (and sometimes from local nurseries or garden centers). They should be planted in spring in rich soil that has been cleared of competing growth (including roots). Mulch will help keep the soil clear for your rhubarb. You can read more about growing rhubarb in the post “A Complete Guide to Growing Rhubarb”. I make a rhubarb puree by cooking the rhubarb with a little water and sugar (to taste) pureeing it and when it is cold I fold in whipped cream. We call this rhubarb fool and it is delicious – the tart taste of the rhubarb with the whipped cream is wonderful.